Adventure Plus for Cats™ offers immediate relief from fleas. It starts working on contact, rendering the flea’s ability to bite within 5 minutes. Adventure Plus for Cats provides Triple Flea Protection: kills adults on contact, eliminates eggs to prevent re-infestation, and kills larvae to break the flea life cycle. 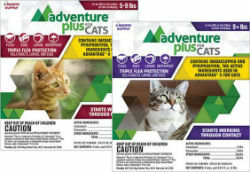 Adventure Plus for Cats comes in a four-dose package. Each dose lasts for up to four weeks for a total of four months of continuous protection. Adventure Plus for Cats is water-resistant and remains effective following a bath, swimming or after exposure to rain or sunlight.